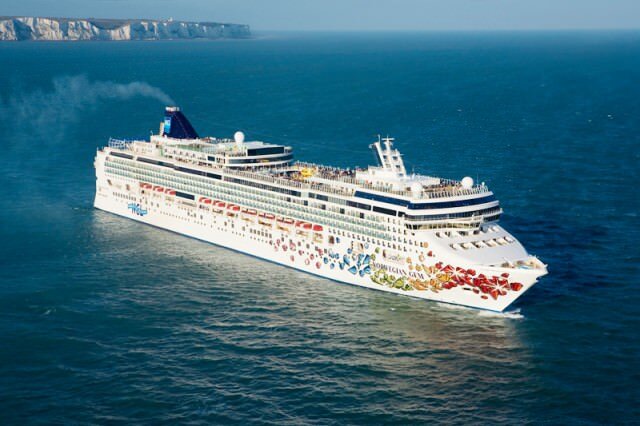 Norwegian Gem leaves the famous, "White Cliffs of Dover" in her wake. Photo courtesy of Norwegian Cruise Line. In the year 2000, NCL decided that cruising had become too stuffy, so it began redesigning its onboard programs and its ships to be more casual, down-to-earth, and just plain fun. The 93,558-ton, 2,380-guest Norwegian Gem and her Jewel-class sister ships are the direct result of that makeover. Launched in 2007, Gem is everything a mainstream American megaship should be, offering a festive atmosphere, great entertainment, a slew of restaurants, awesome children’s centers, fun decor, fantastic suites, and comfortable standard staterooms, all at a fair price. 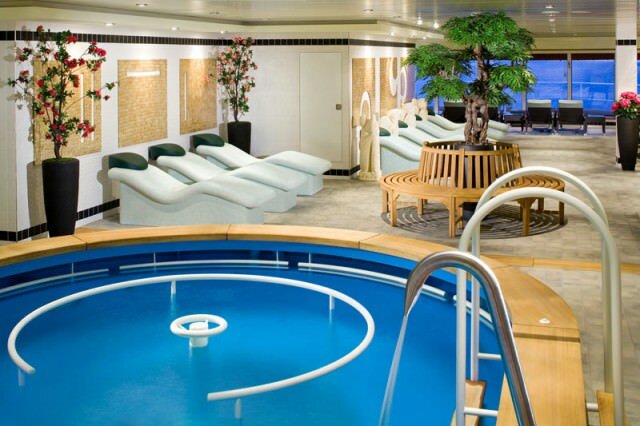 The relaxing Hydrotherapy Pool aboard Norwegian Gem. Photo cvourtesy of Norwegian Cruise Line. Inside, the mood continues from the moment you come aboard, with fantasy furniture and artwork in the atrium lobby, an explosion of bright island colors in both the public rooms and accommodations, and a dash of contemporary and art deco styling in some of her fancier restaurants and lounges. Top of the wow pyramid is the Bliss Ultra Lounge, which juxtaposes Indian Bollywood themes, velvety fashion-world curtains and daybeds, dozens of TV screens for visual mood-setting, and four 10-pin bowling lanes to create one of the most modern hipster night spots at sea. 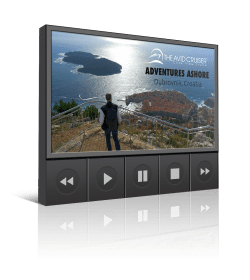 Farther forward, the multi-deck Stardust Theater seats 1,000 guests for some of the best production shows in the cruise world, as well as performances by the great Second City comedy troupe. Up on Deck 13, the Spinnaker observation lounge hosts late-night music and dancing. More intimate, low-volume socializing takes place at midships on Deck 6, where three themed bars are clustered together, one specializing in beer and whiskey, one in martinis and cocktails, and one in champagne. Other public rooms include a large casino, a reading room, a library, an Internet center, a wedding chapel, and a coffee bar. Kids get a huge, bright play area outfitted with cozy TV rooms, a huge climbing maze, and great crafts, play, and computer areas. There’s also a small play area outdoors. Teens get their own hangout space called the Leopard Lounge. The Blue Lagoon restaurant aboard Norwegian Gem. Photo courtesy of Norwegian Cruise Line. Outdoors, Gem’s resort-like pool deck is hedged to port and starboard by a row of palm-tree-shaped street lamps, while a large, Bermuda-style gazebo bandstand sits in the center, among two pools, four hot tubs, and a two-story corkscrew waterslide. Up in the bow on that same deck is the ship’s amazing spa, with its multiple treatment rooms, saunas, beauty salon, and calming relaxation center with its own aquatherapy pool. A large fitness center is next door, and there’s a jogging track and a basketball/volleyball court outside. The sumptuous Master Bedroom of Category A1 Garden Villa Suite #14000. Photo courtesy of Norwegian Cruise Line. 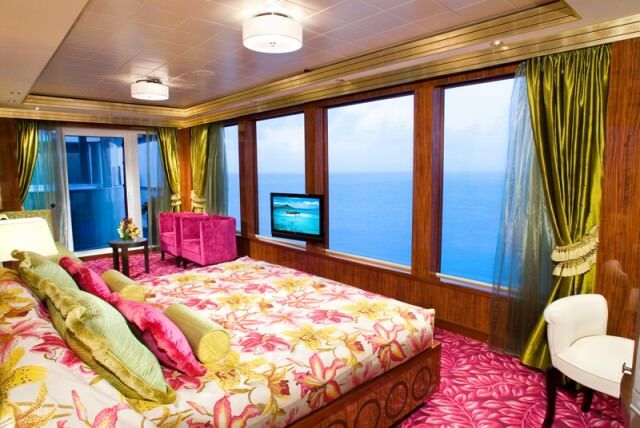 Standard staterooms are comfortable if not plush, decorated in bright fabrics and woody paneling and accents. Furniture tends to be a bit spindly and insubstantial, but overall the rooms are pleasant and livable, with TVs, minibars, well-designed bathrooms, and, in about half the outside cabins, smallish but acceptable private balconies. Outsides range from about 160 to 205 square feet. At the high end, Gem offers 11 different categories of suites, many of them in its “The Haven by Norwegian” first-class section. Top of the heap is the incredible Garden Villa, with its three separate bedrooms, living room, dining room, and private garden. Most distinctive are the two-bedroom, 572-square-foot Family Villas and 440-square-foot Courtyard Penthouses, all arrayed around a private courtyard with its own small swimming pool, hot tub, and plush sun beds. There’s also a private sun deck upstairs and a dedicated concierge lounge, all for the use of Haven guests only. 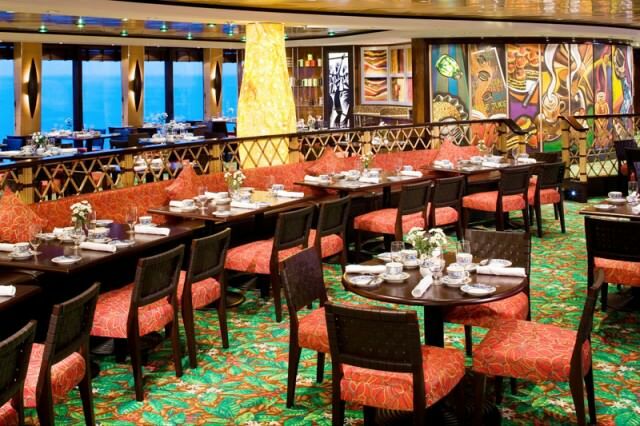 What’s Your Take On Norwegian Cruise Line’s The Haven? I HAVE SAILED WITH MY WIFE ON THE GEM ONCE & HAVE BOOKED MY 2nd TRIP ALREADY……WE KEPT IT SIMPLE WITH AN INSIDE CABIN, IT WAS KEPT NEAT & CLEAN BY THE FRIENDLY STAFF. WE PLANNED OUR MEALS TO BE CASUAL WITH ONLY ONE RESERVED DINNER. EVEN WITH 2,000 PASSENGERS, THERE WAS ENOUGH SPACE TO FIND JUST THE RIGHT PLACE TO RELAX FOR EVERYONE ON BOARD….THE FOOD WAS PLENTIFUL AND TASTY & I REALLY LIKED THE HUGE DAILY SALAD BAR, ALSO WITH DAILY ENTERTAINMENT AND SPECIALS BEING ANNOUNCED, IT WAS EASY TO PLAN AHEAD OR JUST DO WHAT YOU FEEL LIKE AT THE SPUR OF THE MOMENT. 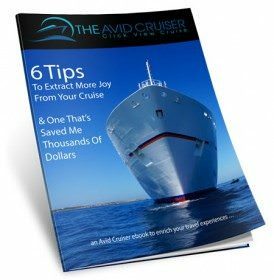 I URGE ANYONE TO TRY A CRUISE AT LEAST ONCE. ???? ??? ?